Taipei, Taiwan, 5 September 2017 – Advantech (TWSE: 2395.TW), a global leader in providing trusted innovative embedded and automation products and solutions, today unveiled its plans for the IBC Show held at the RAI in Amsterdam, September 15 to 19, 2017 where it will be demonstrating the latest additions to its VEGA family of video solutions that enable agile, scalable and cost-effective UHD video processing anywhere in the media workflow. Executive management, senior architects, and product directors will be available at hall 11, booth C32 to share Advantech’s vision on how commercial-off-the-shelf access to powerful video acceleration can greatly contribute to the media industry objective of reducing CAPEX and OPEX with more flexible and efficient deployments that don't jeopardize video quality. “Online video content will dominate in the following years and we can see how key players in the media, telecom, and internet industries are positioning themselves in this direction,” said David Lin, Associate Vice President for Video Solutions at Advantech. “Accelerating this new online video era is in our nature and so we will be at IBC to show companies how we can help them catch the video wave in a cost effective and timely manner”. Advantech has just announced a strategic partnership with Socionext to provide high density and efficient live hardware transcoding solutions for the data center. By leveraging Socionext Media Cloud technology on new Advantech VEGA 7000 Series servers accelerated by the VEGA-3318 transcoding card, cloud service providers and equipment manufacturers will be able to deliver up to 32 x 4Kp60 live HEVC profiles per rack unit – the highest density available in the market – with up to a 20X reduction in power consumption and rack space. 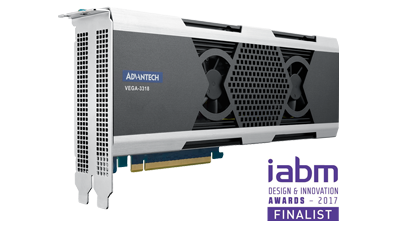 The VEGA-3318 accelerator has been shortlisted for the IABM Design & Innovation Awards 2017 in the Playout & Delivery Systems category. 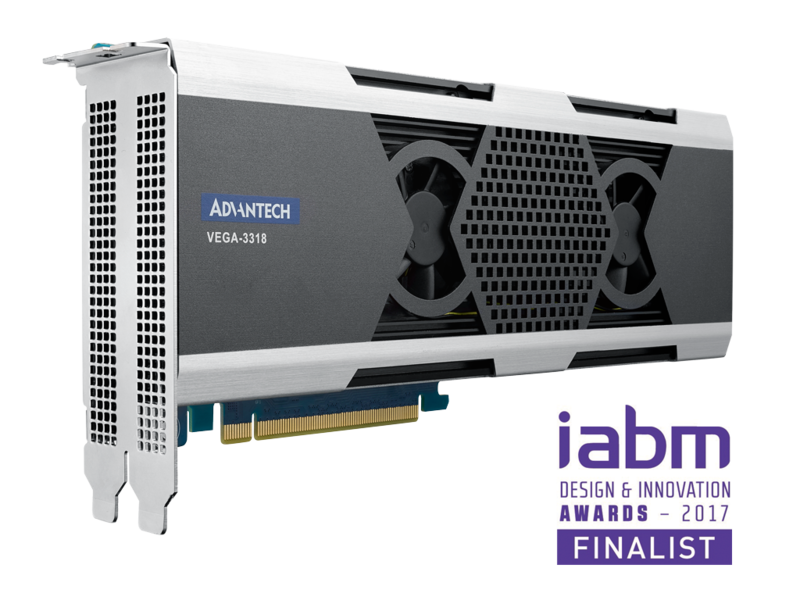 The VEGA-3318 accelerator has been shortlisted for the IABM Design & Innovation Awards 2017 in the Playout & Delivery Systems category. At IBC 2017, Advantech will be introducing its new VEGA-7010 server which supports multi-channel, professional-grade, low-latency UHD HEVC processing in a 1U, short depth system that fills the gap for compute-intensive live encoding and decoding at the edge of the video cloud infrastructure. Advantech will also be demonstrating at its IBC booth the clear, life-like resolution we can expect from next-generation 8K TV in a groundbreaking 1U 8Kp60 HEVC broadcast encoder design based on the VEGA-7000 server and accelerated by the award-wining VEGA-3304, the first of its class to support 8K and HEVC in a compact and ultra-low power PCI Express adapter. In collaboration with its partner Hyper Immersion Technology, Advantech will be demonstrating an innovative 8K VR setup for 360° event live streaming in the cloud. This demonstration will leverage the VEGA-7000 server configured as a compact 1U 8K VR contribution encoder. Enjoying a reduced bandwidth, the HEVC encoded streams can be sent to the cloud to be stitched and delivered as a service which minimizes onsite deployment and optimizes operations. 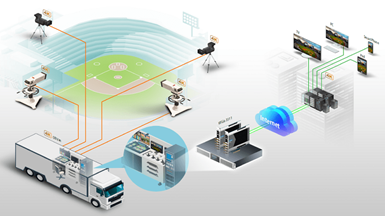 The VEGA 2000 family of small encoding and streaming modules can be embedded in a wide range of applications from self-broadcasting devices that stream video to social networks to wireless professional systems for anywhere broadcasting. The latest versions of the VEGA 2000 family support from 1080p to 4Kp60 resolutions, SDI and HDMI capture, AVC and HEVC encoding, and streaming protocols commonly used by Content Delivery Networks. Advantech VEGA platforms now support the AIMS roadmap and are upgradeable to the latest SMPTE 2110 protocol for ultra-low latency transmission of uncompressed or lightly compressed video over standard IP networks. Video equipment manufacturers looking for interoperable IP media solutions can add the VEGA 3000 PCI Express interface adapters to existing developments or leverage the VEGA 6000 appliances to run next-generation hardware accelerated, IP-based UHD HEVC video processing applications. Also on show, Advantech’s new VEGA-8000 concept switch which supports SDI and IP ports for hybrid deployments. For more information and to book an appointment, please contact video.solutions@advantech.com or visit www.advantech.com/nc/spotlight/IBC2017. If you wish to attend the exhibition, please use Advantech free guest code: 17737. Members of the media interested in scheduling an interview with an Advantech representative, please contact Charo Sanchez at +33 14119 7579 or charo.sanchez@advantech.com. With more and more viewers turning to online video, new concepts such as social media and anywhere broadcasting are gaining popularity among video professionals. The VEGA-2001 helps leveraging the ubiquity of mobile networks and the flexibility of over-the-top delivery without jeopardizing video quality by providing a professional-grade 4K HEVC engine that can be easily integrated into portable broadcasting solutions. The VEGA-2001 is a powerful tool that opens new online media opportunities enabling live event streaming even in the most challenging scenarios where a traditional outside broadcasting setup is not feasible. The VEGA-2001 is a small, low power, real-time encoding module based on Ambarella’s video compression technology which supports UHD resolution and HEVC and AVC codecs. It features 4K video acquisition through built-in SDI or HDMI inputs and encoded video can be streamed to mobile or Wi-Fi networks by connecting an USB wireless adapter. The VEGA-2001 can create multiple output streams from a single video input and encode each one using different codecs with different parameters. The VEGA-2001 offers a user-friendly HTTP interface and can be remotely controlled using a web-based CGI interface. It supports streaming protocols commonly used by CDNs, making it easier for users to deliver video over-the-top.